Okay, maybe I´m late at discovering this but the fat cowboy from the newest Spirit Theme sets has a new skincolour, I suppose he is of Mexican descendance. As far as I know, there are now 5 skincolours... This is complicating customising figures A LOT. Does the female klicky in this set (will) have the "Asian"-skincolour or is it yet another colour-variation? And those pirates in the Movie Theme set with that Roman chariot? "Resistance is futile, you will be boarded!" Collecting Western and animal themes. I didn't notice anything about the hippie - isn't he the usual "tan"? I just checked: the hippie is of normal tan, just like, e.g., Baywatch "David Hasselhoff" of Boys Series 6. The fat cowboy is the odd one out. Thanks for reporting the discovery, Hadoque! The hippie has clearly a darker type of skine tone, compared to the Dutch girl, you can see it in my picture below. But not sure if this is indeed the same colour as the beach boy of series six. Ah, good! I was worried I hadn't noticed! Slowly losing my mind here over getting klickies described properly. Help please! The second-lightest skintone, which I've called "light tan skintone", is VERY hard to detect in most photos/official images - I've picked out some, but I'm sure I've missed a lot. I haven't yet distinguished the third-lightest (the cowboy's colour, also shared by Pru, I believe, and Javier in 70119.) I figure "dark tan skintone" would do. Seems Lucky is "light tan skintone" while Abigail and Maricela are "light skintone", the lightest. Here are all the klickies I've marked as having "light tan skintone" face: anyone here who is definitely the wrong colour? 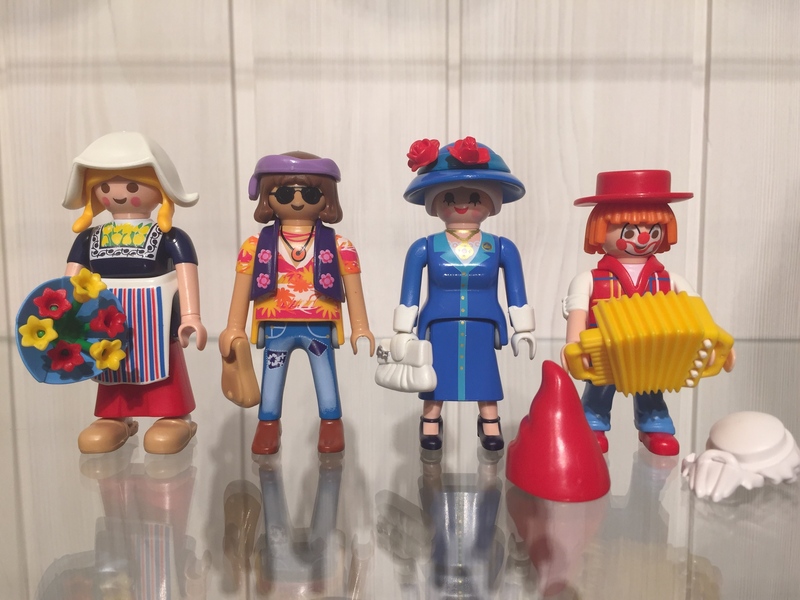 Who's missing (besides the hippie, I haven't created the Series 15 klickies yet)? PlaymoDB.org has catalogued over FIFTY THOUSAND parts in more than 5700 sets. Come and visit to find any set or part numbers you need to know! Which is making buying klikcy-parts (on ebay, cakebook or from someone not directly next to you) much harder... Maybe "their" intention? Like said before and amened by Tahra, it won´t be so easy anymore to find matching arm(sleeve)s, barefooted legs, etc. to create a proper custom-klicky. The newest Hawaii-Girl Series 15 (shown in the pictures in the first post here) also has this skincolour. He came with a Super-4 Magazine, he is based on the pirate on the leftside (from set 4797) but comes with a different coloured jacket and grey legs instead of blue. He came with a Super-4 Magazine, he is a based on the left pirate on the leftside (from set 4797) AND on the pirate in the middle AND comes with a different coloured jacked, grey legs instead of blue, and a different skin-tone. Btw, the hair they came with is very darkbrown and not black. Before I had only encountered this specific hairstyle and this specific beard in black and in lightgrey.